The 1994 Intercontinental Cup was a football match played on December 1, 1994, between A.C. Milan, winners of the 1993–94 UEFA Champions League, and Vélez Sársfield, winners of the 1994 Copa Libertadores. 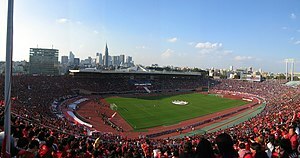 The match was played at the National Stadium in Tokyo. It was Milan's sixth appearance into the competition, after the victories in 1969, 1989, 1990 and the defeats in 1963 and 1993, whereas it was Vélez Sársfield's first appearance. ^ "Toyota Cup - Most Valuable Player of the Match Award". Retrieved 2009-05-14.